Despite how busy things were over the weekend, I managed to squeeze in a few minutes of knitting time on Friday night to finish up my double-knit cowl. I threw it in to soak Saturday morning, and by Sunday it was dry. And I love it! It is super squishy and soft -- as you would expect from a Polwarth/silk yarn! -- and everything evened out nicely with blocking. Now I just have to write up the pattern, a task that's on my to-do list for this week. Fingers are crossed that the weather cooperates enough to take pictures this weekend. Meanwhile, Rainbow's school sweater is just flying along. I'm just about done with the first sleeve (all that's left is the cuff! ), which I only started yesterday. At this rate, I'll have both done by the weekend and all that will be left to do is the button bands and collar, which I'm pretty confident I can knock out in an evening or two. The mornings have started to be cooler, and Rainbow has been wearing a sweater to school, so it will be nice to give her another option when she needs another layer. I have been pondering what to knit next, and while I did spend the last two evenings swatching for a new design, I think it's also about time to start another sweater for myself. I'm pretty sure it's going to be the Cabletta Cardigan, the yarn for which I bought at MDSW two years ago and has been sitting in my stash ever since. I have three skeins of Miss Babs Yowza in a beautiful cerulean; the challenge will be to wind them, given that each skein has a whopping 560 yards in it (they don't call it Yowza for nothing!). My ball winder likely can't fit all of that in one center-pull cake, so I'm guessing I'll have to split it up into maybe two cakes per skein. That will likely work out a bit better for alternating skeins; smaller cakes will be a lot more manageable, even if they will mean more ends to weave in. It is getting decidedly more fall-like -- cooler temperatures, less daylight -- and while I'm not happy about all of the changes, I am happy that it is getting to be sweater weather. Here's hoping I can burn through some of my sweater stash this year! It's been a crazy but fun weekend, so tonight's post is going to be rather short. I didn't do much knitting or spinning this weekend, so there's not much to show, but I did manage to finish spinning a bobbin of fiber. And the fiber had the perfect colors for a beautiful fall day. Although this colorway is called Lily, it reminds me very much of the fall foliage. My plan is to spin up another bobbin with the other colorway (Water) and ply them together. As to the wool, because this is the first time I'd spun this type, I'd say it was probably as different from my last spinning project as it could be. This is definitely a much hardier wool, probably better suited toward outerwear. 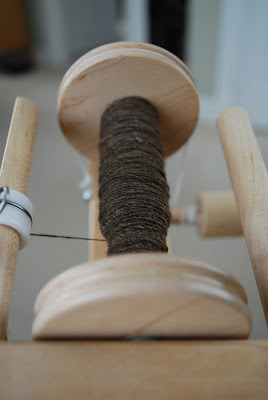 I did pull a fair amount of kemp out of the fiber as I was spinning. It's certainly not a luxurious spin, but I'm enjoying it. It's a very wooly wool, and sometimes I really like spinning fiber that seems like it hasn't strayed too far from the sheep. I do a lot of knitting in lightweight yarns, so I'm used to things going rather slowly even when I have time to work on them quite a bit. So it's been very pleasing to work on Rainbow's school sweater because it is knitting up almost faster than it seems possible. Worsted weight yarn for the win! I am nearly finished with the body of the sweater at this point, in large part because I've been bringing it to work to knit on during lunch this week. I added an extra inch of length before the ribbing, and I'm planning on making the ribbing a bit longer for some additional length. I want to make sure that Rainbow will be able to wear this for a while and, considering the high cotton content in this yarn, that even if it shrinks it'll still be a good length. I will say that I'll be happy to be done with this. I do like the yarn (Spud & Chloe Sweater), but the aforementioned high cotton content makes it really hard on my hands. I'm also noticing a bit of rowing out, which doesn't normally happen to me with wool. I'm hopeful that it will block out (though certainly Rainbow won't notice the difference if it doesn't). Meanwhile, I'm so, so close to being finished with my double-knit cowl. I'm on my very last round before I bind off, so I think another half hour to 45 minutes of knitting time will see it done. I'm hoping to have time to block it this weekend, but it's going to be a busy one. My brother-in-law is getting married on Saturday, and the festivities start tomorrow evening. Both the Mister and Rainbow are in the wedding, so I expect I'm going to be doing a lot of running around. I know when Sunday rolls around, I'll be desperate to sit down with my yarn and needles to decompress. Way back in May, I knit a hat with one of the last remaining skeins of Madelinetosh in my stash. I knit it for the Mad May original design contest, and it got a lot of positive feedback, but then it started to get warmer and I didn't want to think about hats and cold weather, so I put it aside for a bit. Today, I'm finally ready -- and really excited! -- to share it with you. Kelp Crown is a slouchy hat in three sizes: Child, Adult Small, and Adult Large, to fit a head circumference of approximately 20 (22, 24) inches. It gets its name from the stitch pattern that encircles the head. The twisted stitches and bobbles reminded me of those underwater plants you see in film of scuba divers and the like -- those delicate green things that gently sway from side to side with the movement of the water. My sample used one skein of Madelinetosh tosh dk in Dr. Zhivago's Sky, but any DK or light worsted will do (basically any yarn that will knit up at 6 stitches/inch). The fit of this hat is meant to be ever so slightly snug at the brim (though you can adjust this by changing your needle size) and slouchy in length. If you prefer more of a beanie style, it's easy to subtract some length before the crown shaping. The stitch motif in this hat is both charted and written. The stitch pattern uses twisted stitches, simple two-stitch cable twists (which can be accomplished with or without a cable needle), and small bobbles. The pattern has also been tech edited and test knit. I'm really looking forward to wearing my hat as the weather gets cooler, and I hope you enjoy the pattern! I wish I had kept track to know for sure, but my rough estimate is that this skein took me seven hours or more to ply. But it is done, at long last. It took me a good 20 minutes to wind all this yarn onto my niddy noddy (439+ wraps, by the way! ), and it's now been washed and is hanging to dry. The full report will come next weekend. For now, though I'm not starting just yet, I'm looking forward to new spinning projects, as my August Southern Cross Fibre shipment arrived earlier in the week. (Yes, I'm aware that it's September. But David was out of commission with pneumonia for a while, and then there's the whole crossing the ocean from Australia thing.) I am blown away by the gorgeousness in this shipment. I knew which colorway David had selected for me, but I loved both colors so much that I ordered the other one. This is Laurel Crown (above) and Triumph (below). Both are on organic merino top. Can you see why I couldn't have just one? I have spent the last couple of days knitting furiously on a swatch for a submission, which of course I can't show you (though you'll see it eventually in some form, I'm sure). It was knitting that needed to get done, but it doesn't make for very good blog fodder. Since finishing the handspun socks and the swatch, I've brought my double-knit cowl to work for my lunchtime knit break. I'm hoping that the little bit of extra knitting time will help me get it done soon; though I've gotten faster at the technique, I'm still knitting twice the stitches that I would for a regular cowl of this size, so it does take time. I'm still entertained by it, though, so my urge to finish isn't out of ennui but rather excitement to have a finished cowl! In case you are not familiar with double-knitting, allow me to explain. This is a technique that gives you completely reversible double-thick fabric. You do it by working with two colors of yarn (always held together) and working in pairs. The first stitch of the pair is always knit and the second is always purled, and if you work the first stitch in color A, you'll work the second in color B (and vice versa). It sounds rather complicated, but in practice it's fairly straightforward. If you can knit 1x1 ribbing, you can do double-knitting. I'd highly recommend Alasdair Post-Quinn's Adventures in Double-Knitting Craftsy class if you're a visual learner like me. I'm hoping to spent a fair amount of time knitting and spinning this weekend. My brother-in-law is getting married next weekend, so this weekend is the last bit of calm before then. The weather is also supposed to get significantly cooler and more fall-like, so I really do need to get moving on Rainbow's sweater and perhaps even start one for myself! For a while there, I was stuck in the knitter's black hole where I kept knitting but nothing ever seemed to get bigger. This weekend, I finally overcame that. 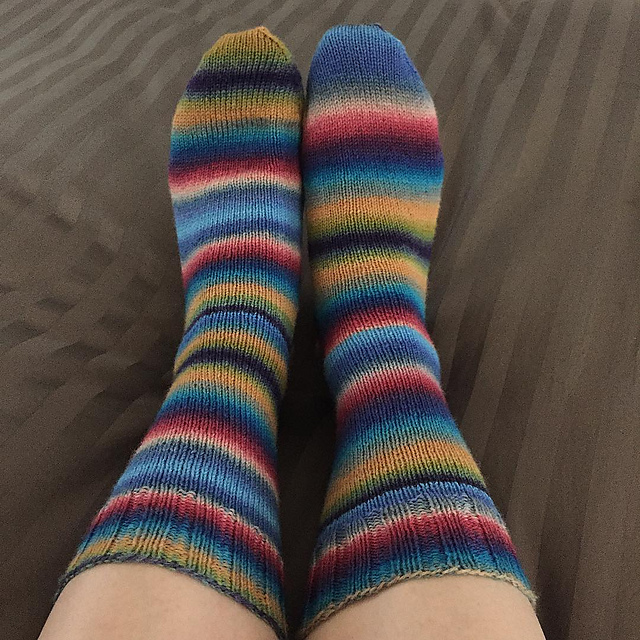 For starters, I finished a pair of socks! These are plain vanilla stockinette socks worked over 70 stitches using a size 0 (2.0 mm) needle. The yarn was my handspun, what I'm calling "pseudo-self-striping" yarn spun from Three Waters Farm Falkland that I bought at MDSW last year. I have not weighed them yet to see how much of the yarn I used, but there's still a significant amount of the skein left. I finished these Friday night -- just in time to wear them on Saturday, when it was cool and rainy all day. I spent several hours on Saturday working on Rainbow's school sweater, which I'd cast on last Saturday (apparently this project is destined to be worked on on Saturdays). I've finished all the raglan increases and will be ready to separate the sleeve stitches from the body stitches on the next row. I didn't feel like I had to hurry to get this sweater done, but then the temperature dipped over the weekend, so perhaps I'll be working on it on days other than Saturday now. The temperatures are supposed to go up again this week, but true fall weather will be here before we know it, so I'll need to keep moving on this. The other project that finally seems to be making progress is my double-knit cowl. As I've gotten further into it, I've gotten faster at it, so I'm now able to get more done per knitting session. I've got about a repeat and a half of the pattern plus the plain rounds left to do. I'm really excited about this project. It's come together a lot better than I was expecting. I'm hoping that it will block out a little larger so that I can double it comfortably. The cooler weather has put me in the mood to wrap something soft and cozy around my neck! This weekend has felt decidedly fall-like (I even had to break out some hand-knit socks to wear! ), so naturally I want to knit and spin all the things. I honestly wish I had twice the free time each night so that I could spend two hours knitting and two hours spinning -- it's hard to ignore one in favor of the other! I did spend Wednesday and Thursday evenings at my Lendrum finishing up the second (and final) bobbin of singles of my Southern Cross Fibre South African superfine/silk. The camera couldn't capture the shine of these -- 50% silk makes for some really shiny yarn! I've started plying these on the miniSpinner in the interest of time, though I can tell I will be in this for the long haul -- laceweight just doesn't happen quickly, even with an electric wheel! While the Mister was putting Rainbow to bed last night, I wound the roving up into individual bundles of about 2 oz. each (in case you're wondering, that string is tied to the end -- it's all one long strip of fiber in the bag). The fleece was about 4 pounds, if I remember correctly, when I bought it, and after washing and processing, I ended up with just shy of a pound and a half. Some weight was obviously lost in the lanolin and dirt that washed out, but I also have a small batt that I carded up on my own as a test before I sent the rest off. I reserved 22 oz. for an actual process, and I'm using the remaining bit (about 1 5/8 oz.) to do some sampling. This was a fine fleece with a relatively short staple length -- certainly too short to comb -- so I expected that the roving would be a bit neppy. The singles that I'm spinning aren't particularly smooth, but I think the finished yarn will have a nice tweedy texture to it. I'm thinking that a three ply will work out best, but I'll ply up some bits of the sample and see what I like. I'm hoping to get a sweater out of this fiber if I can. Finally, I got another fibery surprise this week when a package arrived from Australia. I'm expecting my next SCF club shipment any day now, but this was my prize from Tour de Fleece (which David was kind enough to everyone who participated on the SCF team and posted a finished skein). The bag this came in was labeled "International Wool of Mystery," so I have no idea what it is. I'm pretty sure the colorway is Vetinari, which was one of the Mega SAL colorways, or at least a sibling of it, but the fiber is definitely a mystery. It's very soft, though, definitely soft enough to wear comfortably against my neck, so I'll keep that in mind when spinning it. It certainly looks like there will be a lot of time spent at my wheel in the weeks ahead! This is the fourth and final post in a series about self-publishing a knitting pattern. You can read Part I here, Part II here, and Part III here. At this point, I now have a beautiful layout with all the pieces of my pattern in it. What happens next? Aside from the actual creation of the pattern, the most important part of the process is tech editing. Once I have a first layout of my pattern done, I send it to my technical editor. A good tech editor is an invaluable partner in the design process. A tech editor checks through the pattern for the usual things you'd expect (typos, grammatical errors, missing or incorrect punctuation, etc.) but also checks all the math, confirms that written instructions match the chart, and makes suggestions about wording. A tech editor will also make sure that your pattern is complete (i.e., it has all the necessary information that a knitter will need to make the item in question) and that it's consistent throughout (for example, making sure you don't have ssk in one place and SSK in another). Tech editors charge by the hour for their time, so it's well worth it to make sure a pattern is as complete and as correct as possible before they receive it. More complex designs and designs that are graded to multiple sizes generally take more time; I've had tech editing bills that have ranged from $10 to close to $100. I've worked with several tech editors over the years and primarily work with one who I really click with. She's fast, she knows my writing style, and she makes great suggestions. She's also really good at what she does, so sometimes I'll use another editor if she's backed up with work from other designers and I have something simple. Once I receive technical edits back, I make any necessary changes to the layout. Then the pattern is ready for test knitting. There are a number of testing groups (both knit and crochet) on Ravelry, and I have used them in the past, but now I run all my tests in my own Ravelry group. Many of the members of the group have tested for me before and are eager to test again, but I also will sometimes post about a test in other groups to get some new testers. Designers have many reasons why they have their patterns test knit. Some, for instance, will use test knitters in place of a tech editor; I don't do this. When I put a pattern up for testing, I have already had the pattern tech edited and sometimes read through by someone else. I'm not looking for test knitters to catch mistakes (though there have been a couple of times when someone has caught a typo). Instead, having other people knit the pattern before it's available to the general public gives me an idea of how the average knitter on the street will approach and use my pattern. Sometimes something will be worded in a way that is technically correct but perhaps not as clear as it could be, for example, and my testers will make suggestions about how to make that instruction more clear. Using test knitters also gives me a good check of my yarn estimates for those patterns that are graded (because the sample is knit in only one size and I use math to estimate how much yarn will be used for the other sizes). An additional benefit of test knitting is that when the pattern is published, prospective buyers can see other completed projects on Ravelry and can get an idea of what the pattern might look like in yarns and colors other than what I used for my sample. Once the test is complete and any necessary adjustments to the pattern have been made, it's ready to be released to the world! I publish on Ravelry, Patternfish, and LoveKnitting, and then I go about publicizing the new release: I blog about the design, I post on Twitter and Instagram, and I post about it in the pertinent new releases threads on Ravelry. If you've made it through all four posts, thank you for reading! I hope you now have a better understanding of the process of self-publishing a knitting pattern (and, I hope, an appreciation for the time and effort involved). It's not an easy or a fast process, but it is a process I love and one that I hope to continue to be able to do for years to come. This is the third in a series of posts about self-publishing knitting patterns. You can read Part I here and Part II here. Once I have a final draft of my pattern and a completed sample, it's time to put all the pieces together to create the pattern that will actually be for sale. One piece that's very important is the photos. I'm not a professional photographer and don't have any formal photography training, but I do my best to take high-quality, clear photos so that prospective buyers can get a good sense of what the pattern looks like. If you've looked at my shawl patterns, you'll notice that many of them are taken on a dress form, and the reason for that is because it's easier for me to get a good shot of a shawl if I'm the one behind the camera. My husband can be a great photographer, but he usually focuses on the person rather than the knitwear, so I try to use him only when I can't take the photo myself. The final pattern may use only two or three photos, but to get those two or three, I might take a hundred shots (and this is where it's really wonderful to have a digital camera, because I can always delete the bad shots!). Once I've narrowed down my shots to a handful, I do some editing. I often crop out unnecessary space around the knitting and sometimes adjust the color or correct small imperfections like a strange small shadow or a piece of lint. Another important piece to finalize at this point is my charts, if my pattern uses any. I use charting software called StitchMastery to create my charts. It is a great program because it's very easy and fast to create a chart and I can save the resulting image in a number of different file types. Once the chart is in its final state, I also finalize the written version of the chart if it's a lace/cabled/textured stitch pattern. The software will automatically generate a written version of a chart, though for me it's only a place to start; I have to edit what the program spits out so that it follows my style and format. I'm always sure to do a side-by-side comparison of the written instructions and the chart at this point, because typos and glitches do happen. The final step is putting the pattern into a layout that combines the written instructions, the photos, and the charts. Although I've done some simple layouts on my own, I'm very lucky to have a friend who is a former graphic designer to do most of my layouts for me. She uses InDesign to create really beautiful, professional layouts (and she won't let me pay her for it, either, so I end up "paying" her in yarn and fiber, as she's also a knitter and spinner). I send her the final pattern draft (after I've done a last read-through), any charts, and a selection of photos, and she sends me back a PDF of the pattern. At this point, the pattern is nearly ready to be published, but there are two more steps to take before I upload the pattern. I'll talk about those in the next post. 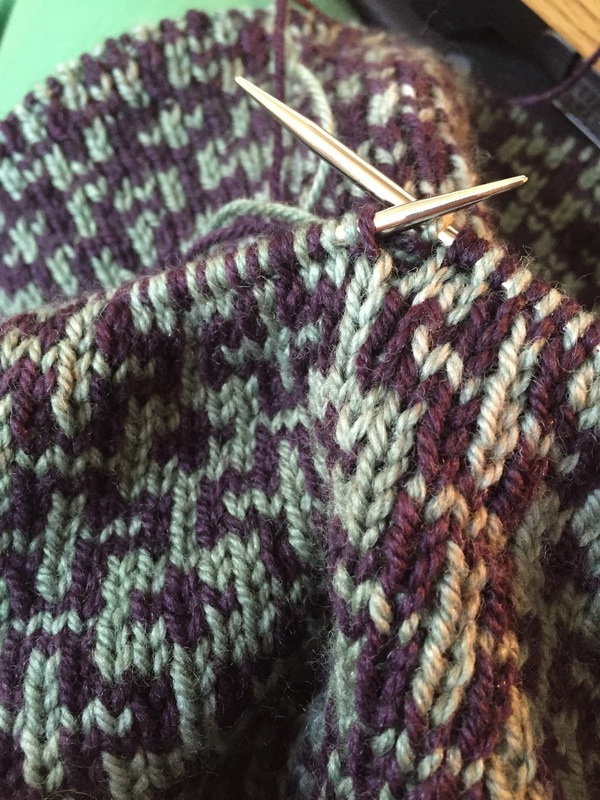 This is the second in a series of posts about the process of self-publishing a knitting pattern. You can read Part I here. So, I have my pattern idea, a roughed-out sketch, maybe some charts of the stitch pattern, and a swatch. I've selected my yarn for the sample and am ready to move forward. What comes next? The answer to that question depends a lot on the item I'm knitting. In most cases, I'll start with a basic outline of the pattern. For a shawl, for instance, I'll usually have a rough idea of how to start (I'm fond of the garter tab) and where my increases will be. If there's a regular stitch pattern, I can create the main instructions, though I may not yet know the number of repeats of those instructions until I get the knitting on the needles. Sometimes the outline is in my head, though, and I have to start knitting first and write down each step of the pattern as I go. If I'm knitting a hat, for example, I might not know how wide of a brim I want until I knit part of it and try it on to see if I like the proportion. If I had to estimate, I'd say probably 2/3 of my patterns are written while the knitting is on the needles. The rest are usually written as a draft before I start working on the sample and are often tweaked as I knit. Usually I am able to finish up the first draft of the pattern before the sample is finished, even if there are some holes (for instance, I can't put in the finished dimensions of a shawl until it's off the needles and blocked). To help me make sure I have all the pieces of the pattern, I have a pattern template that I use for all my self-published patterns. This template ensures that I've got all the necessary information -- yarn, needles, gauge, sizes/dimensions, abbreviations -- and it's always in the same order. This is similar to what publications like magazines do; if you publish a pattern in a magazine, you'll often get a template to fill in with your pattern information along with the publication's style sheet (basically a list of guidelines for how to list certain abbreviations, how to punctuate your instructions, how to refer to certain stitches, and so forth). While I am putting the pattern together, I'm also working on the sample. Before I can do that, I need to have the yarn I want to use. I'll often swatch with leftovers, but there's usually not enough to knit the actual sample, so I need the yarn before I can start knitting in earnest. In many cases, that means a trip to my LYS to buy yarn (or some online shopping if I'm looking for something my LYS doesn't carry). But I've also been lucky enough to work with some indie dyers and yarn manufacturers who have provided me with yarn support. That means they provide me with the yarn for the pattern for free; in return, I feature their yarn in the pattern and list that yarn on the pattern page on Ravelry when the pattern is published. Because the model in my pattern photos is usually me or someone in my family, if I'm making a sized item, I knit it in a size to fit the intended model. I'm also careful to weigh my yarn before and after knitting (or I just wait and weigh the entire finished piece when it's done) in order to figure out how much yarn I used and calculate how much yarn will be needed for other sizes, if there are any. When the sample is done and blocked, I take any final measurements needed and fill in any empty spots in the pattern. Now I have the pattern written and the sample knit. What comes next? Find out in the next behind-the-scenes post! We interrupt your regularly scheduled series of posts about self-publishing knitting patterns in order to publish a knitting pattern! Arrowood is a simple, classic top-down triangle that uses knit/purl texture to create a design reminiscent of the end of an arrow. For me, it was the perfect knit when I needed something relaxing -- you need to pay a little bit of attention on some rows, but most are fairly mindless, soothing knitting. The pattern is suitable for a beginner and uses only knit, purl, and directional increases. It's worked from the top down, starting with a garter tab, and I also give you instructions for how to make it smaller or larger to accommodate the amount of yarn you have. I know that I pretty much have to like my own designs, but I think it says a lot about how fun this was to knit that I knit two in a row! I hope you have as much fun with it as I did. 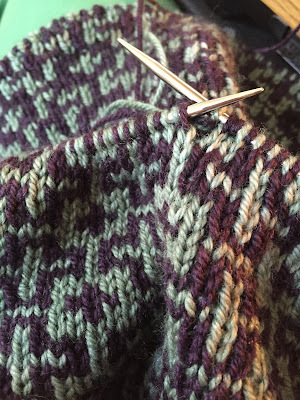 This is the first in a series of posts I'm doing on what the process is like to design a knitting pattern for self-publishing. As I'm sure is the case for many creative types, ideas for patterns come to me at the oddest moments. There are times when I can sit down with the intention of coming up with an idea, of course, but those moments are rare and rarely fruitful. Instead, ideas usually come when my brain is occupied with something else, like when I'm at work or reading a book before going to bed. Because I'm usually busy with something else when I get an idea, I'll usually jot down a brief description and a rough sketch on a scrap of paper. As a result, I have a fairly substantial pile of these bits of paper on my bedside table and even more in my design notebook, which is where they go to live when the ideas start to become more than just a rough sketch. Once I've got the initial idea, the next step is fleshing it out a bit and seeing how (or sometimes if) it will work. If there's a lace or texture or colorwork pattern involved, I'll get out some graph paper and a pencil and make a rough sketch of the chart. Sometimes I'll do this using a charting program (I use StitchMastery at home to create my charts for my patterns, but sometimes I'll doodle in an online program like Stitch Fiddle). Often there's swatching at this point, too. Seeing a lace pattern on paper is one thing, but usually I have to knit it in the yarn I'm thinking of using (or at least something in the right weight and fiber) to see if it looks as I want it to. Swatching is also important for determining gauge and sizing. This is less important for an unfitted item like a shawl -- in that case, what's most important is a fabric I like. But if I'm knitting something like a hat for which I'll grade the pattern for multiple sizes, then I need to get a fabric that works well with the stitch pattern and figure out the gauge to do my grading math. There are other things to consider with swatching, too. Fiber choice is important. If I'm designing something that really needs to hold a blocked shape, then I'm likely to go with a wool or wool blend. There's color to consider. If there's a lace or textured stitch pattern, then I have to consider whether the color of the yarn will help or hinder its visibility (and this point is why you'll very rarely see my pattern samples in variegated yarns). And I also think about my yarn choice and my intended audience. Is this pattern going to appeal to people who like hand-dyed yarn? Is the pattern going to require many skeins of yarn or just one (so what's the total cost of the yarn for the project)? Is this a yarn that will be easy for a knitter to obtain should s/he want to use the same yarn as the sample? Once I've sketched, swatched, and selected my yarn, I move on to the next step: writing the pattern and knitting the sample. But I'll save that for the next post. Some new spinning tools have arrived at my house in the past several weeks but I've neglected to mention them. First of all, after hearing Jasmin of the Knitmore Girls rave about hers, I ordered a RAVPower Power Bank. The main purpose for this battery pack is to use it with my Hansen miniSpinner so I don't have to worry about plugging it in to an outlet. This will be great if I want to take it out in public or to my LYS to spin (places where finding an outlet can be problematic or cause a tripping hazard). An added bonus is that several things can be charged at once, so I can also juice up my phone or my iPad if I need to. The other fun things that arrived about a week and a half ago are two new Akerworks bobbins for my Lendrum. These flat-pack bobbins have ends that are 3-D printed; you get to choose from several patterns and quite a few colors. I went for Honeycomb in magenta and Sunflower in powder blue. These bobbins are great because they pack flat (obviously) and are really lightweight, so it's easy to throw a couple in a bag with some fiber and take them out. They're a bit more expensive than a standard bobbin, but only by a few dollars. They're custom made for you, too, which means you get exactly what you want. I haven't tried these out yet, but I'll be giving them a spin for my next spinning project on the Lendrum. Meanwhile, I'm still spinning the current project the old-fashioned way, though I'm getting very close to being done with the singles. This is the second bobbin of Southern Cross Fibre South African super fine/silk singles; I'd estimate I have maybe two to three hours of spinning left to do to finish it. I didn't set out to spin the yarn this finely, but with 50% silk in the fiber, it just wanted to be thin, so I'm going with it. I may use the miniSpinner to ply it, in the interest of getting it done quickly, so perhaps I'll have a finished skein to show you by next weekend. I am continuing to plod away on my two active projects, and sadly there isn't a whole lot of progress to be seen. I've added maybe another two inches to my sock, so I am getting closer to the heel though it doesn't look like much. And I've added another couple of rounds to my double-knit cowl, which really doesn't seem like much considering that I've actually gotten faster at the technique. I'm about halfway through the second pattern repeat at this point; when I've finished this repeat, I'll weigh my yarn to get a better sense of how many total repeats I'm going to end up doing to maximize my yarn usage and minimize the chance of playing yarn chicken at the end. I am counting on the long holiday weekend coming up to make some real progress on these projects and to cast on for Rainbow's school sweater. I did manage to type up directions for it the other night, so I just need to wind some more yarn and get started on that. And I am definitely hoping to do some more spinning; I had an eye exam yesterday and couldn't really do much with my pupils dilated, so I spent a bit of time at my wheel yesterday and enjoyed it immensely. But I'll talk more about that on Sunday! It's Tuesday, right? Going away for the weekend and taking two day off from work has thrown me for a loop -- I've been forgetting what day it is all day. I had hoped to get a post up on Sunday, but by the time we got home, ate dinner, unpacked, did laundry, and got Rainbow to bed, I was about ready to pass out. It's just as well, because I didn't have much spinning to show anyway. The weekend away was a lot of fun, even if I didn't get as much knitting done as I'd planned. Though I'd taken an extra skein of sock yarn along just in case, I didn't need it. I managed to finish only one sock (which was already half done when we flew in), and that was done in the car on the way to the airport to get our flight home. I quickly Kitchenered and wove in my ends so that I could stow my little tool bag in my checked bag -- I did not want to risk losing my pretty bird scissors -- and promptly cast on for the second. What you see here is the result of knitting at the gate while waiting to board and during my lunch break today. It looks like I'll have a decent amount of yarn leftover when the second sock is done. I'll have to weigh the leftovers to see just how much, but it's possible I might get a short pair of socks for Rainbow out of what's left. I did a bit of knitting on my double-knit cowl last night, and I'm close to finishing up the first pattern repeat. The pattern is finally starting to emerge, and it's exciting to see that it works in yarn as it appeared to work on paper. I don't know if I mentioned that the yarn I'm using is Yarn Hollow Tango, a luscious blend of 85% Polwarth wool/15% silk. The Ravelry page for this yarn says that it comes in a put-up of 662 yds./605 m per 7.97 oz./226 g, but my skeins are labeled 4 oz. and 330 yards. Considering this is a DK weight, that's still pretty generous yardage. The yarn is really delightful to knit with, too. The silk adds a bit of sparkle, and I'm pretty confident that when I block the cowl I'll be able to get some additional length and drape from it. Rainbow started kindergarten today (can you believe it? ), so on my to-do list tonight is typing up the instructions for her school sweater. It's likely to be a while until she needs it (her only complaint about her first day was that she got all sweaty from playing on the playground), but I'd like to get started. I'm sure it will be sweater weather before I know it.